I don't know what percentage of the articles on this site are about value betting, but I'm guessing it's quite high. I make no excuses for that because the fact is value is everything if you want to win. Today I've been prompted to write about value betting by a bet I had last week. This was a typical bet from Carl Nicholson's Value Backing service. Cool Friend was the only selection from the Value Backing main service and was advised as an each way bet at 50/1. So the first thing I did was to get my bet on and secure my price. Step two in my thought process was how the heck did he pick this and why. So I took a close look at Cool Friend. What I found was that Cool Friend had won at Aintree, which was where it was running today, and had won over a 9lb higher mark and today it was also getting a 7lb mares allowance. So essentially this horse was well in and a contender but for some reason it was priced at 50/1. Now that is a value bet. And that is today's message, don't look for nailed on winners, look for horses that can win given the breaks but that are priced so big, at such a value price, that should it win that it will pay for a lot of losers. I don't know what true odds Carl assessed this mare to be but I would guess around 16/1, if you can get 50/1 on a 16/1 chance then you should be betting these as often as you can. Amazingly Cool Friend started at 33/1 and was beaten by a neck into second on the line by a 100/1 shot. It was still a great return but could've been a big big win. It's been a good week for Value Backing followers with an 18/1 winner yesterday and a 20/1 winner last Monday. I subscribe to Carl’s service and also several other ‘value’ backing services. One which was doing OK had a big winner yesterday. 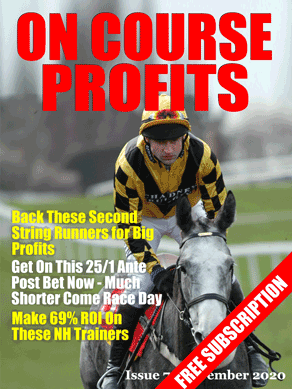 Nick Pullen gave 3 selections for the Grand National including Auroras Encore as an E/W at 80 to 1. I staked all 3 equally! I forgot to say Nick’s service is called Winning Race Profiles. What I am missing is a service which can find ‘value’ across the whole odds range. Although I can find my own value bets on a horse like Frankel, Big Bucks or Sprinter Sacre, such horses don’t run very often. And whilst Value backing Extra is now putting up some shorter odds selections (one at 5.5 above today), I am still looking for a high strike rate value selection service. I am currently testing out Supreme Horseracing from the Steve Davidson stable. Has anyone got some other good ideas for candidates?